Correa backhouseana is coastal shrub. It has thick, broad leaves that are hairless on the top. 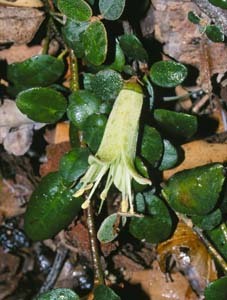 The petals are greenish yellow, and like most Correa species held together in a tube. 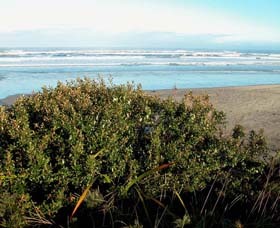 It occurs on exposed, rocky and sandy shorelines on the on the west and south coasts of Tasmania (compared to C. alba, which occurs in similar habitats on the east and north coasts, and has white, spreading petals).